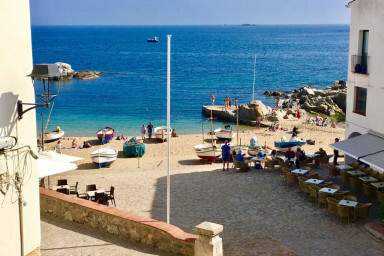 Right at the heart of Calella de Palafrugell's beach Boulevard. New and stylish, with all the comforts! This apartment, located right in the middle of the lively Calella, brings you a jawdropping view! A fully equipped kitchen, bedroom with a large wardrobe, bunkbeds smartly placed on the hallway, and a unique bathroom. The living room is spacious and airy, perfect for a refreshing and relaxing holliday. The property is located in a beautiful, unique and authentic building, with a beautiful stairway. It provides a parking lot (not for very large cars!!) that will make things easy for you! It is a small old fishing town, with a lot of history on its façades, a beautiful beach, and tones of stores throughout. It is well connected to the beaches close by through the "Camí de Ronda", which we higly suggest you as a day walk! Es un buen sitio para alojarse. Lo mejor la localización y el parking. Apartamento muy grande y comodo, muy bien equipada la cocina para poder cocinar cualquier cosa. Los muebles eran todos nuevos y la decoración preciosa Ubicación excelente frente al mar, con muchos restaurantes alrededor y dos supermercados para comprar. Como aspecto negativo: dificultad para encontrar el parking que ofrece el alojamiento. Nosotras encontramos aparcamiento gratis en la calle. Clean and amazing all amenities u could want! Huge kitchen!! Best view ever! Très bel appartement de style et emplacement superbe. Appartement très bien équipé, spacieux et superbement situé. Le plus qui fait la différence est le garage privé clos.